What Do Acure Organics Product Reviews Tell Us? After having recently discovered Acure Organics products philosophy and dug deeper into user reviews, it was only a matter of minutes for me to decide to write a review providing you with all the necessary information about the company’s manufacturing values, special product ingredients, popular products that users love as well as how pleased they are with this line of natural and organic skin and hair care products. What has also made me grow interest in Acure was the very positive reviews of people who were dealing with different skin problems like eczema, cystic acne, acne scars, oily and dry skin. That shows the healing power Acure skincare products can have as well as their effectiveness and high quality of ingredients. Of course, another thing that I really liked about the company apart from being fair trade was the environmentally friendly values based on which the company is running and flourishing. For example, their packaging is made of recycled and 100% biodegradable materials. Apart from that, each time a body lotion of theirs is sold, one tree is planted via the Organization “Trees for the Future” and each time a hair care unit is sold, 10 cents go to supporting Water.org, an organization that has been providing safe water and sanitation solutions to those in need for more than 20 years. What Is So Special About Acure Products? Acure organics contain some unique natural and certified organic ingredients such as Chlorella Growth Factor and active stem cells. A combination of 5 organic super fruits and herbs like Acai, pomegranate, blackberry, rosehips and rooibos has scientifically shown to neutralize free radicals and reverse aging signs. Chlorella Growth Factor is rich in DNA and RNA which account for healthy cells and is clinically proven to protect our skin’s collagen and elastin. While studies have shown that 1% of CGF is able to increase collagen production, Acure anti aging products contain 5%. These nutrition based cruelty free skin care line of products is free of synthetic preservatives, parabens, phthalates, sulfates, petrochemicals and fragrances. It is also gluten free. For me, another great advantage of Acure organics is their very low price. There are not that many high quality truly natural and organic skin care companies today, with excellent feedback coming from people, which also charge so low for their products, and I think that this is something really appreciable and even surprising. So, let’s have a look at some of the top reviewed Acure products, their features and how people feel about them. Acure Organics Scrub is a gentle facial scrub which people find that has helped them tremendously deal with their difficult skin issues such as eczema, acne scars, oily skin and others. So, apart from removing dead skin cells, this product is actually quite healing and balancing. Good for all types of skin. 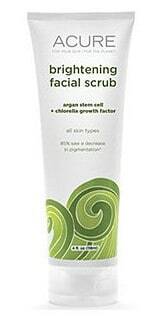 Exfoliates and stimulates new skin cell production. Earth Day Beauty Award Winner 2015. Organic Acai Berry, organic Blackberry, organic Rosehips, Organic Pomegranate, fair trade organic Rooibos, organic Calendula, organic Chamomile, organic Aloe Vera Leaf Juice, Vegetable Glycerin, French Green Clay, organic Lemon Peel Granules, Saponifed organic Coconut Oil, Vegetable Cellulose Gum, organic Olive Oil, organic Sea Kelp, Cocoa Powder, organic Chlorella Growth Factor, Chlorophyll, Fermented Sugar, Carageenan, Argan Stem Cells, organic Argan Oil, Potassium Sorbate (food grade preservative), Lilium Candidum Leaf Cell Extract, Sage and Spearmint Essential Oils. It is clear that this scrub is high in anti-oxidants and skin beneficial ingredients. Brighter skin: Removing those dead skin cells satisfactorily leaves their overall skin looking fresher and brighter. Nice texture: The grains are small but powerful and don’t scratch or damage the skin in any way. Refined and refreshed complexion: The product rinses clean, leaving the face nicely fresh and soft feeling. Tiny balls of lemon peel exfoliates the skin well: Users really like the fact that the tiny lemon peel balls exfoliate without causing the irritation that many exfoliating scrubs result into. They also feel that these little balls really remove the dirt and oil from their pores. This scrub is a green color due to the French green clay and the sea kelp, which some users might find off putting, but once they try this scrub, they forget all about the color and concentrate on how good their skin looks. 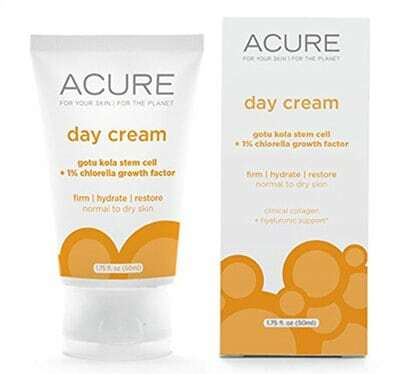 Acure Day Cream is an easily absorbed moisturizing day cream which protects from the damage that the environment as well as the free radicals have on your skin. It is also potent in supporting collagen and elastin. Appropriate for normal to dry skin. Organic Acai Berry, Organic Blackberry, Organic Rosehips, Organic Pomegranate, Organic Calendula, Organic Chamomile, Fair Trade Organic Rooibos, Organic Aloe Vera Leaf Juice, Cetearyl Alcohol, Fair Trade Organic Cocoa Seed Butter, Organic Safflower Seed Oil, Glyceryl Stearate SE (Vegetable Derived), Vegetable Glycerin, Organic Sunflower Oil, Infusion of Organic Calendula Flower in Organic Olive Oil, Fermented Sugar, Gotu Kola Stem Cell Culture, White Horehound Stem Cell Culture, Echinacea Stem Cell Culture, Fermented Resveratrol Extract (Probiotic), Organic Argan Oil, CoQ10, Olive Leaf extract, Organic Chlorella Growth Factor, Red Mandarin Oil, Natural Vitamin E, Organic Evening Primrose Oil, Potassium Sorbate, Clove Bud Oil. Healthy looking skin: People with acne issues and other skin problems find this cream absolutely healing, which shows how widely beneficial the ingredients of this cream are. Can wear under makeup: Women like the fact that their makeup goes on smooth and even over this moisturizer without balling up under the liquid makeup. No greasy or waxy feel: It doesn’t leave behind a greasy, oily or waxy feel, but instead leaves your skin feeling light and refreshed. Helps hold in Moisture: People find this face cream to be adequately hydrating. Absorbs into the skin well: It quickly absorbs into the skin rather than simply sitting on top. Acure Facial cleanser is designed to purify and cleanse your face without drying it. It removes makeup while also helping maintain the skin’s natural acid mantle and boosting new cell production. Very good for oily and combination skin. 2015 “betternutrition” Best Of Natural Beauty Award Winner. Organic Acai Berry, organic Blackberry, organic Rosehips, organic Pomegranate, organic Calendula, organic Chamomile, Fair Trade organic Rooibos, Lauryl Glucoside (Vegetable Derived), Decyl Glucoside (Sugar Soap), organic Olive Oil), organic Chlorella Growth Factor, Glucono Delta Lactone (Fermented sugar), White Horehound Stem Cell Culture, Echinacea Stem Cell Culture, Fermented Resveratrol Extract (Probiotic), organic Argan Oil, Ubiquinone (CoQ10), Olive Leaf Extract, Potassium Sorbate (Food Grade Preservative), Lemon Essential Oil, Citric Acid. Helps Reduce Acne Scars: Users feel that continued use of this product combined with other Acure products can reduce the appearance of acne scars. Skin looks overall healthier: People find that their skin looks overall healthier while feeling really clean. Works well on sensitive or combination skin: Those with sensitive skin believe that this organic face cleanser works well for them. It does not seem to work as well, though, for people with really dry skin but this is stated by the company which clearly specifies that this product is appropriate for combo to oily skin types. Removes make-up easily: Women like the fact that this gel removes their makeup easily without having to scrub their face excessively. Acure Argan Shampoo is a repairing shampoo designed to provide lasting moisture and even the most dry and damaged hair, making it soft and manageable. 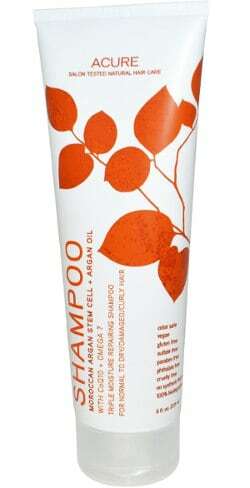 This organic product is also recommended for curly and normal hair while it is safe for colored hair as well. Improves the hair’s overall quality. Organic Acai Berry, organic Blackberry, organic Rosehips, organic Pomegranate, organic Fair Trade Certified™ Rooibos, organic Aloe Vera Leaf Juice, Sodium Lauroyl Methyl Isethionate (from Coconut), 100% naturally derived Betaine (from Sugar Beets), Vegetable Glycerin, Sodium Methyl Cocoyl Taurate (from Coconut + Amino Acids), Sodium Cocoyl Glutamate (from Coconut + Amino Acids), Cocoglucosides Hydroxypropyltrimonium Chloride (Sugar Conditioner), Sodium Levulinate ( corn derived), Guar Hydroxypropyltrimonium Chloride (Guar gum conditioner), Potassium Sorbate (food grade preservative), organic Argan Oil, organic Fair-Trade Certified™ Olive Oil, vitamin E, sea buckthorn seed oil, organic Pumpkin seed oil, Ubiquinone (CoQ10), Argan Stem Cells, glycerophosphoinositol lysine (from sunflower), Almond Extract, Cassia Bark Oil. Lathers well: Many users are surprised at how well it lathers since it has all natural ingredients. 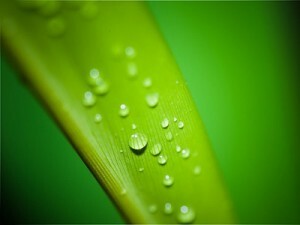 Cleans well: They feel that it really cleans their hair well and leaves it more soft and manageable. Hydrates: The Argan as well as the other natural oils in this formula help keep your hair from drying out. Really makes your hair shine: The pumpkin seed oil and the sea buckhorn adds Omega fatty acids to your hair which improve its overall health and make it shine. No frizzes: People with frizzy hair, who have to use extra products to control it, have found that after washing with this shampoo, they neither need to use a blow dryer nor a styling product since their hair is free of frizzes. Relieves itchy scalp: People with itchy scalp are really pleased they were able to deal with itchiness after using this natural shampoo. Finally, after digging more into Acure Organics, I can say that this is really a worthwhile trying out skin care and hair care line of products with many positives for even problematic skin issues. Also, the fact that all of Acure products prices are considerably low compared to their quality and effectiveness is one more fact that can be simply irresistible for the potential buyer.